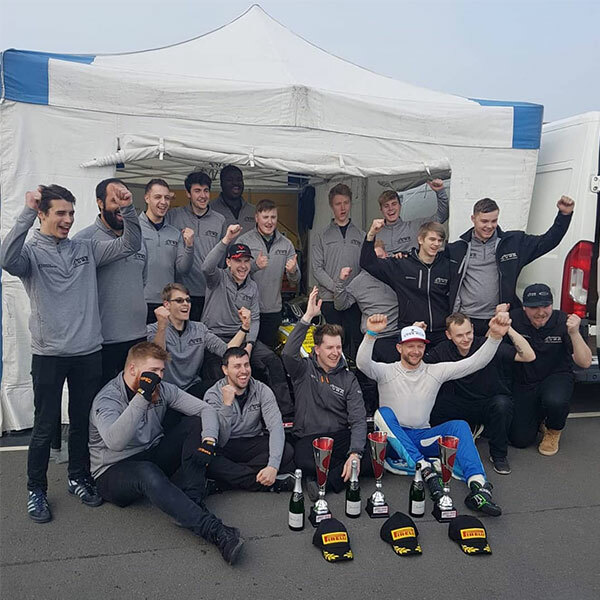 The 2019 Racing Wolves F3 Cup team is made up mostly of first-year engineering students who have spent the winter months training and preparing for the season ahead. The most notable difference is the brand new livery for 2019, which sees us leave behind the flourescent yellow in favour of a clean, bold look. The weekend started well for the team, with Shane Kelly and Matt Fenton working closely with the students to prepare the car and get in some practice laps on Friday afternoon. Qualifying took place at 09:30 on Saturday morning, and despite a cold and windy start, the racing wolves had the Dallara F308 at assembly in plenty of time. 14 cars made up the Donington Park grid, with a mixture of F308 and F312 cars (the F312 being the most recent car design allowed in the Cup competition). With both Carey and the 2018 second-place-man Stuart Wiltshire in the running, the only notable omission was the 2017 champion Jacopo Sebastiani, who is sitting out the 2019 competition, guaranteeing a closely fought contest once again. Qualifying went well for UWR, with Kelly showing strong pace at his favoured track. However, Carey showed all of the pace of 2018, setting quick lap after quick lap. In the dying seconds of the 15 minute qualifying session, Kelly put in in a sensational lap, stealing Pole Position from Carey by just 0.087 of a second for Race 1. This was definitely a sign of things to come. Race 1 took place in the same cold and windy conditions as the qualifying session. Carey made a fantastic start, beating the bright yellow UWR car to turn one. Undaunted, Kelly stayed on Carey’s shoulder during the full 15 minute race, always on the look-out for a chance to retake the lead. As the time ticked down and both cars put in quicker and quicker laps, Kelly made a few attempts at over-taking, but couldn’t quite get out in front, instead taking second place by just 0.46 seconds. George Line took 3rd place, 18 seconds adrift of the leading pair. Sunday morning came, just as grey as Saturday, but slightly less windy. The team were also joined by several families from our University of Wolverhampton Children’s University project, attending Donington for the first time and seeing the hard work that goes into being a race engineer. Matt Fenton worked closely with the student data engineers, analysing Saturday’s performance and looking for extra tenths of a second to help Kelly sneak past Carey, who was sitting on Pole Position in Race 2. Another fantastic start from Carey meant that he was once again first into turn one, although the UWR car was once again hard on his heels. Kelly stayed in touch and the 1st and 2nd placed cars pulled away from the rest of the field. As Carey approaced the back markers, it seemed that an opportunity might come for UWR to challenge for the top spot, but with 3 minutes to go in the race Daly span off the circuit in a dangerous position, causing the race to be red-flagged and concluded early. Carey, Kelly and Line once again took the one, two, three and the team celebrated another close race and strong performance. It wasn’t long before the team were back at assembly for Race 3, and this time the sun was peaking out to raise the temperature and thaw some chilly students. Carey, Kelly and Line had secured 1st, 2nd and 3rd on the grid through their efforts in Race 2, and once again Carey made a storming start. So too did Stuart Wiltshire, propelling himself from 4th to 2nd, leaping past UWR and George Line. To compound his disappointment, Line would then be given a 5 second penalty, dropping him further still down the racing order. In the midst of the drama, the superior speed of the UWR F308 soon put paid to Wiltshire’s strong start, Kelly charging past him and beginning to reel in the flying Carey. The annoucement of a safety car 5 minutes from the end gave the racing wolves further hope that the gap could be closed, but Carey cannily passed a back marker at the last possible moment, leaving an obstacle between Kelly and his prey. As the safety car slipped into the pit lane and Carey roared away, the back marker proved just enough of a distraction and Kelly couldn’t capitalise. Another comfortable 2nd place was in the bag, and 2nd place in the championship was secured, ensuring that the UWR team would need to find another trophy cabinet on their return to Telford. Dave Tucker, Principal Lecturer in Motorsport Engineering, said “Following on from the successes UWR have enjoyed in previous years it’s testament to the team that they are continuing to strive to make improvements wherever possible. This weekend saw a phenomenal first round, and we’re already looking forward to Snetterton in May." The F3 rounds previously advertised on the 29th and 30th June at Silverstone have been rescehduled by the Competition as Silverstone is being resurfaced ahead of the British GP. This weekend of racing will likely be deferred into the autumn, and I will confirm dates as soon as possible.